On June 18, Voice of the Voiceless called on President Obama and The White House to issue a Presidential Proclamation to celebrate July 2013 as a historic month for ex-gays, who have for years, suffered discrimination and intimidation because they dare to exist. “Thanks to the 2009 judicial ruling, ex-gays no longer have to hide in the shadows in fear of intimidation and threats from anti-ex-gay activists and media who seek to marginalize and diminish our community,” commented Doyle. 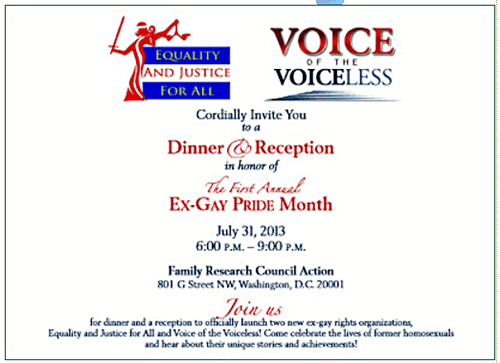 To celebrate this historic month and day of lobbying in Washington, D.C., VoV is also co-hosting an evening dinner and reception with Equality and Justice for All at Family Research Counsel Action. Invited speakers include Congresswoman Michelle Bachman, Former Senator Jim Demint, Liberty Counsel’s Matt Staver, Congressman Tim Huelskamp, and several prominent leaders in the ex-gay and faith communities. For more information on Ex-Gay Pride 2013, view the invitation by clicking here. To become a sponsor for the evening dinner and reception and/or to purchase tickets, click here. Obviously Marcus Bachman won’t be attending. ﻿NOW IT IS OFFICIAL – Ender’s Game Is A Bona Fide FLOP! Congresswoman Michelle Bachman, Former Senator Jim Demint, Liberty Counsel’s Matt Staver, Congressman Tim Huelskamp…Voice of the Voiceless. So the voice of the voiceless is hateful? Not really that unusual. We have these all the time. Usually they’re held in the local all-male adult theatre.